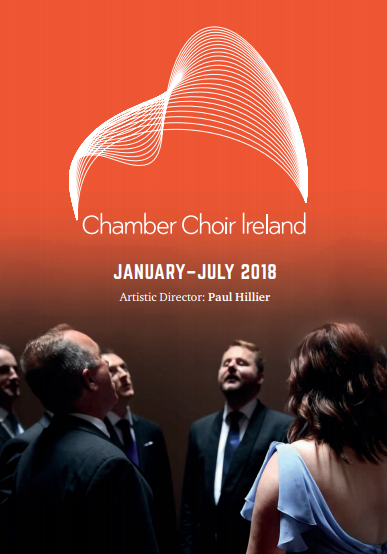 January-July 2018: New Season Brochure Chamber Choir Ireland: from Sacred to Secular but always spectacular. We're delighted to unveil Chamber Choir Ireland's upcoming concert season.Have a look now at the upcoming concerts in Dublin, Belfast, Cork, Belgium and Wales. Season Brochure covering upcoming Concerts and Learning & Participation events. From sacred to secular, but always spectacular, we’re delighted to unveil Chamber Choir Ireland’s upcoming concert season. CCI’s upcoming concerts feature a raft of exciting composers, premieres and collaborations. Our first concert takes place on 2 March, when we join forces with the Irish Chamber Orchestra to perform the Irish premiere of James MacMillan’s Stabat Mater, conducted by the composer himself as part of New Music Dublin 2018. Later in March, Artistic Director Paul Hillier joins us to conduct Hearing Sacred Harmonies, the second of our sacred programmes, with works from Howells, Messiaen and Poulenc paired with the Irish premiere of Gregory Rose’s contemporary Stabat Mater. In April’s Choirland Revisited we take a fresh look at Irish composers and music related to Ireland, including a new commission by Andrew Hamilton and a trio of works by David Fennessy. This concert series will tour to Cork, Dublin and Belfast, as well as to Belgium and Wales with thanks to valued support from Culture Ireland Great Britain 18. Guest Director Nicolas Fink will end the season with Between Us, a programme of Sacred music reflecting on the very personal relationships each of the featured composers had with their own faith. Frank Martins’ stupendous Mass for Double Choir is joined by works by Josef Rheinberger and Max Reger. Our 2018 Learning and Participation strand is filled with a great array of events, including lectures, Composers in the Classroom Gala Concert, a seminar at Cork International Choral Festival and plenty more for all ages and interests. As always we are indebted to the Arts Council/An Chomairle Ealaíon for its continued support along with the funding received from the Arts Council of Northern Ireland through the National Lottery Fund, and Dublin City Council. Thanks also to our many partners and collaborators as well as our growing Friends and Chamber Choir Ireland societies. Tickets are now on sale, please click the images below for further information or have a look at our new season brochure January-July 2018. We look forward to seeing you over the next few months.